UPDATE: Kits are due to ship from China by the end of November. No promises that they will land in modelers’ hands by Christmas, but may still reach many of you by the end of the year. 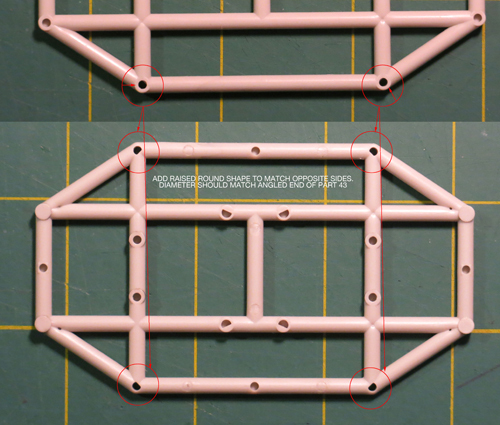 The parts- We’ve received two rounds of test shots. You may have seen comments from Jim Small or Jay Chladek online about the first set of those. 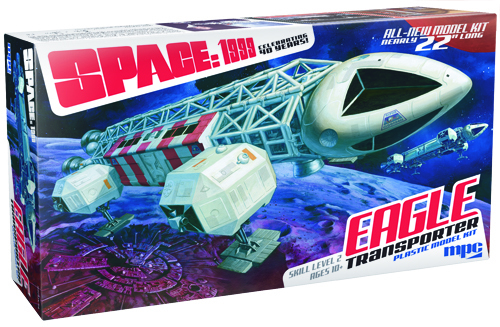 I’ll admit I’m holding back a little bit on this one in order to save something for Sci-Fi Fantasy Modeler’s Eagle special where I’ll be contributing an article. Btw, to pre-order your copy click right here! I’m doing my best to balance the distribution of info between here and there. I guess I’ll start by saying that beyond flaws in the surfaces of parts caused by the tooling process that there was not a whole lot to be addressed. There were minor fit issues here and there with pins missing, sink marks etc. All were to be expected in a preliminary test shot. 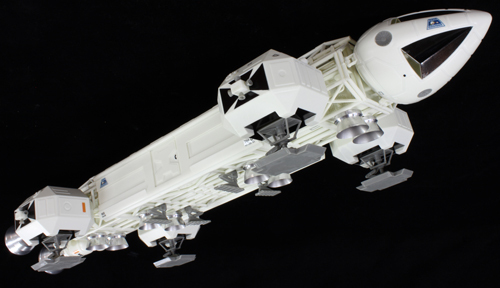 Other than that, the kit really assembled nicely once I wrapped my head around a few of the sub assemblies. It is one thing to see all of the parts and understand how the end product is supposed to look and see what assembly “theories” worked out and which didn’t. 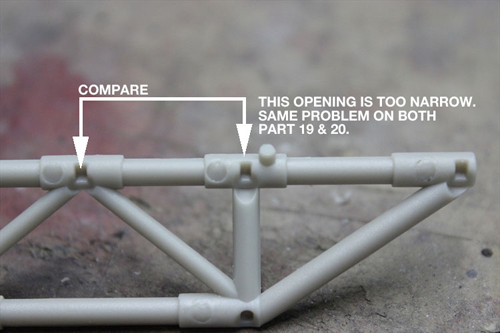 Even not noticing very slight differences between some of the frame tube parts caused problems in my first attempt. 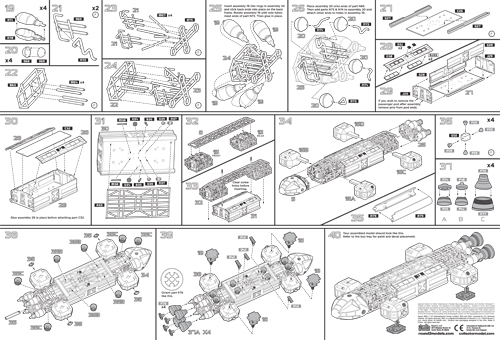 Keep in mind none of the parts get numbered until the next step. A few lessons were learned, but all for the better and the initial build went together satisfactorily. I always ask for 10-12 initial test shots for plenty of testing and distribution to consultants and select media outlets. 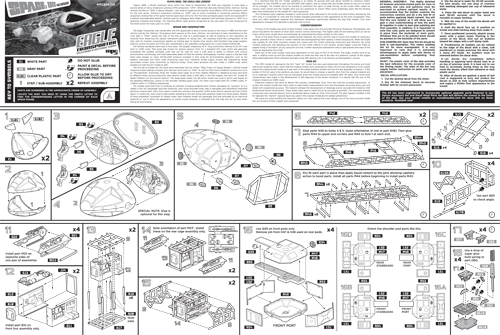 Most might think “ooh, 12 sets!” Well, they go pretty fast once you start handing them out. I kept three. One got assembled, one was used to retrace steps in the build to document trouble areas in the parts and one was kept intact for our archive. Three got sent to Jim Small to use for our buildup. 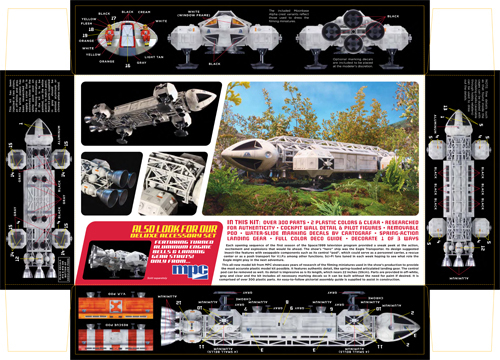 That allowed extra parts for immediate replacement for the build and the ability to build a rescue pod in addition to the standard passenger pod. He was also due a copy as a consultant on the project. Our other consultants Daniel Prud’homme and Chris Trice were also sent one copy each. A set was sent to Sci-Fi Fantasy Modeller for upcoming issues. Two sets were sent to Mat Irvine to take along for his SFFM interview with Brian Johnson. One set was awarded to Jay Chladek for winning in the JerseyFest model competition. Let’s see… ten fingers and couple toes… Yep, that was all of them. Back to the parts themselves, I mentioned we received a second round (only two sets this time) and most of the problems were resolved, but they never all get taken care of even at this stage. There were still about ten points to correct. 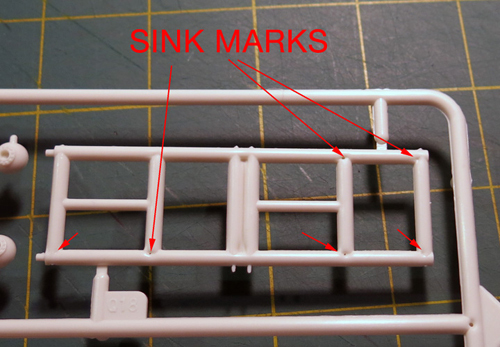 The biggest problem to overcome was sink marks in the tops of the landing footpads. The parts were originally solid, but had to be broken into two parts each. 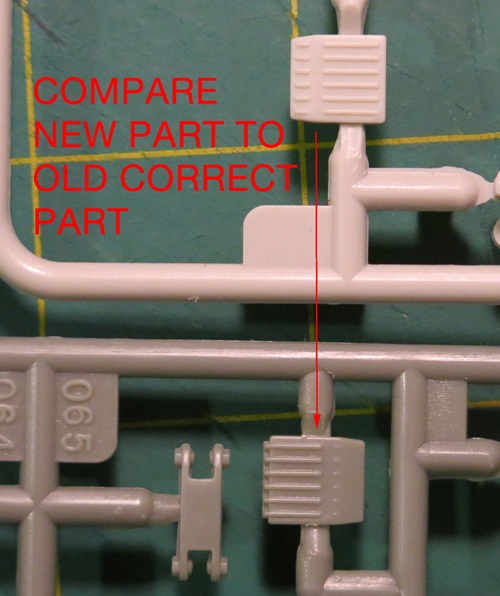 This required a bit of rearranging other parts on that particular sprue to make room for the second sizable piece. The change resulted in more problems. In some cases, the factory’s work takes us a step backwards and this case was no different. 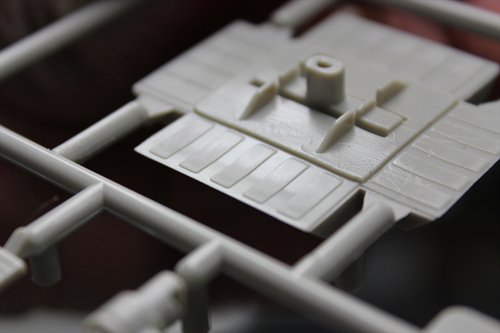 One of the features of the kit is that we are injecting it in two colors, “eagle” white and gray with windows supplied in clear plastic. This means that if one wants to, he can build the ship without having to paint it. I’m of the mind that is looks a little toy-like in this state, but adding the metal engine bell accessories helps, and just a little chalk dust added to the corners and crevasses would supply a superb look without painting in full. Here is a pic of Jim’s “naked” build with the larger metal bells installed. Other stuff- I was very hesitant to reveal all of the news I made in my last Eagle post because it all felt too good to be true and that any of the deals I mentioned could fall apart at any moment. And I’m sorry that I have to report that one of them did… for the moment. It seems the ability to move decals from Italy into China for pack-in is disastrously problematic without the proper red tape taken care of. 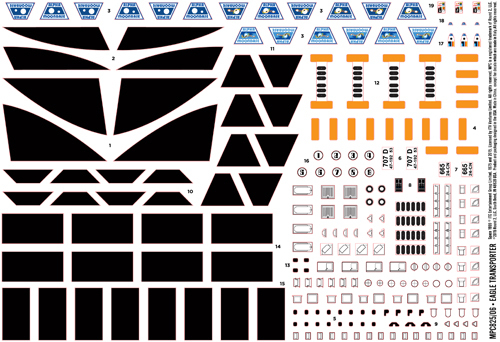 This is something that is being worked through presently and we full expect to be able to use Cartograf decals in upcoming Polar Lights, MPC and AMT kits by mid 2016, but unfortunately it just can’t happen in time to include them in this release of the Eagle. We currently and will continue to include them in our Hawk and Lindberg branded kits. The move to change to Cartograf has sent a clear message to our current Chinese decal suppliers and stepped up attention to quality has been ensured. 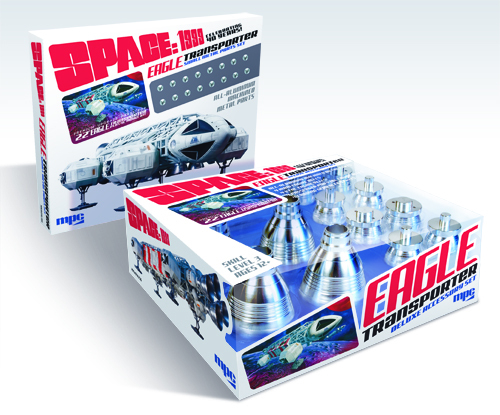 I have tested proofs of the Eagle decals and they performed admirably and responded to the use of setting solution. More updates on the inclusion of Cartograf decals will come when definitive info becomes available. On the plus side, Mat Irvine’s interview with Brian Johnson seems to have gone off without a hitch. Since the interview Brian has delivered a special behind the scenes treat for Eagle connoisseurs, a rare photo of the Eagle model crew along with a full listing of everyone that worked on them! Wrapping up- Okay, that’s about all comes to mind at the moment. Have a happy Thanksgiving! Oh… you ask when will the kit come out? It is November and that was the release date we’ve published, isn’t it? Yes, well, despite our best intentions November is not to be. Currently, it looks like kits should arrive in the nick of time before Christmas. No promises as always, but the honest truth is that is how it looks at the moment. I’ll post an update when I hear they are being loaded onto a boat. 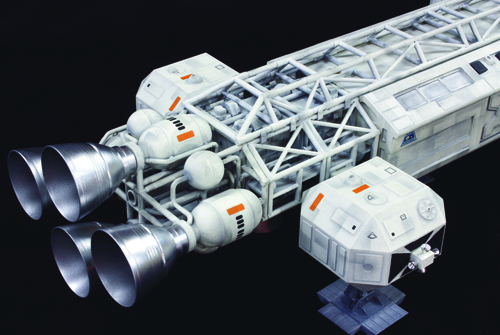 Until then… build a deluxe 12” Eagle Deluxe Edition or Moonbase Alpha. As always, Happy modeling! 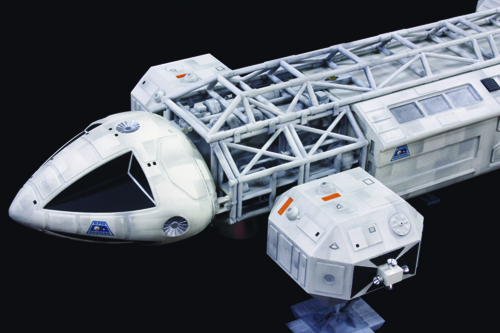 This entry was posted on Tuesday, November 17th, 2015 at 12:00 pm	and is filed under Eagle Transporter, MPC, Round2 Models, Space:1999. You can follow any responses to this entry through the RSS 2.0 feed. You can skip to the end and leave a response. Pinging is currently not allowed. Another beauty to add to my collection. This kit looks outstanding. I love everything about this kit. Is that an art print included with the kit ? Great to hear from you Jamie, I for one am very excited about this kit. I was a little skeptical on the box art, but it didn’t take but a few hours to become a perfect box cover to me. I hope I didn’t say anything too harsh. It’s going to be an exciting few months for our Facebook group. Busy with members showing their builds. I figure this is going to be the most fun we’ve had in a long time…….Hat’s off to you Jamie! Really happy to see this kit progressing. 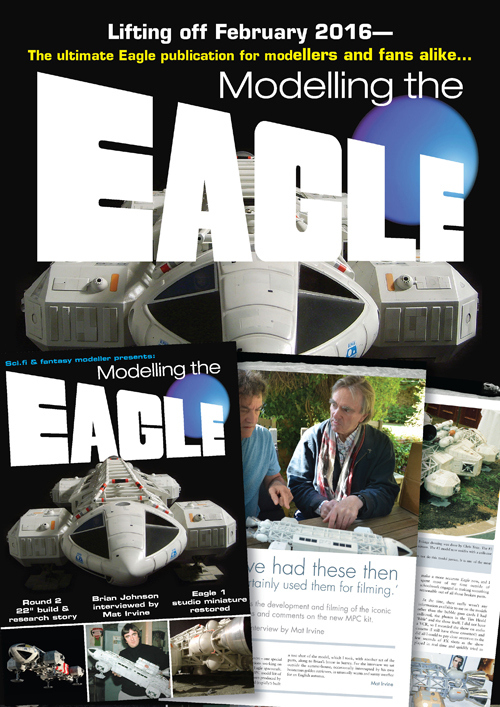 I’ve long wanted a large scale accurate Eagle kit but just couldn’t see paying the price for the resin kits. This kit is within my budget and it looks fantastic from what I’ve seen. Really hope you are able to release this in December. I already have one on pre order and can’t wait to start building. Thanks again Round 2 for giving modelers what they want. 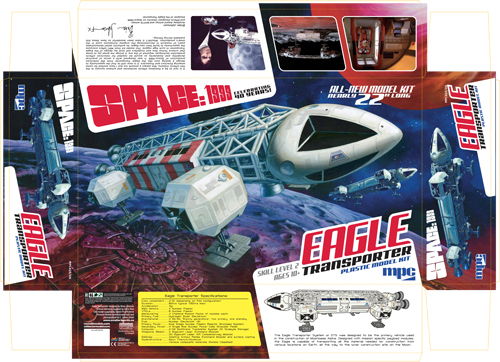 Is there any chance that in 2016 you will make available separate passenger pod kits so we can customize and interchange them on the Eagle kit? I’d be keen to add a survey Eagle pod to the basic tranporter Eagle pod. And yes, I can’t wait for the Eagle kit to arrive. 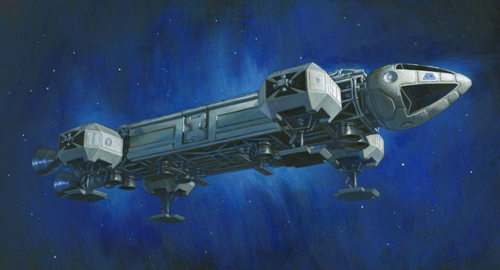 We don’t currently intend to offer pods separately from the Eagle. Laser tanks have been discussed, but no telling at the moment if/when we’ll get to do those. Great job all around, Jamie, and thank you for the update. Love that you’ve managed to have a sit-down with Brian Johnson. Oh, and a quick question: you mention the aluminum engine bells being “larger” than the plastic ones. Is one slightly more accurate than the other? Just curious. They are dimensionally the same as the ones in the kit. 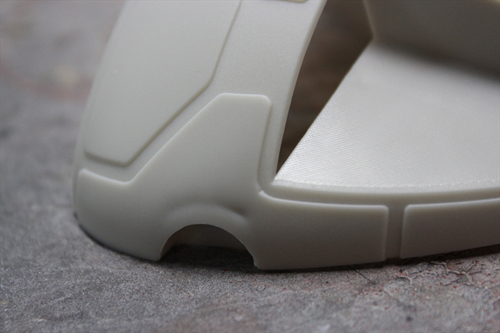 We are just getting much better detail in the metal parts that we can get with injection molding. By larger I was referring to the bells included in the Deluxe Accessory set. 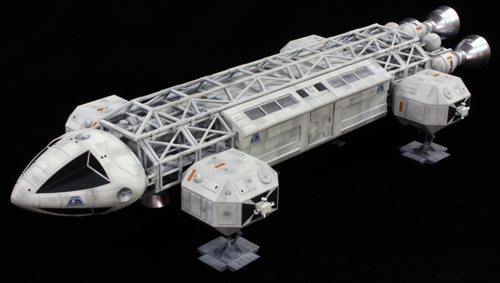 We are also offering a small metal parts set that only contains the 16 small RCS bells. These were not shown in the buildup pictured. Thanks for the update. I will purchase one of these eventually, but not until I have a new Galileo kit in hand. Any idea of a release date yet for the red headed step child of shuttles? Nothing I can talk about at the moment. You guys keep putting out my “holy grail” kits, I might run out of grails! While disappointed about the Cartograf situation, I look forward to this release with eagerness. Great info on the eagle! I’m doing just what you suggested! Building one 12 inch highly modified and one stock. Any thought on a Commlock and Stungun kit set? I would buy a few. Wow. Excellent. A Stungun has been suggested. Honestly not sure if/when we might ever do something like that. Provided it’s not the Exploration Set equivelent, go for it! Those would be nice pieces. Maybe there’s some other small prop item to flush a combo kit further. Congrats on the boxart! It has a great feel that syncs with the show. That box art is awesome! 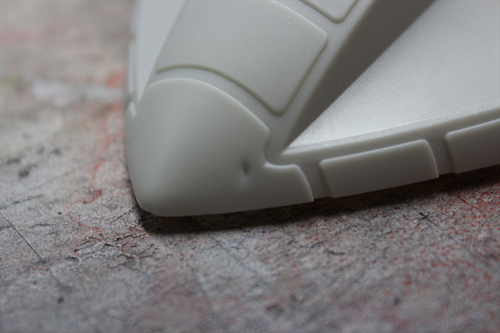 The idea to mold the kit in two colors, one for average builders is a great Customer service. Not all companies would care about the consumer at the end of it all in that manner. What a great result this kit must feel like to you – that box art is something else! I actually have a Moon Buggy model coming from a Shapeways designer (two actually, since I want to convert it to an Amphicat as a companion display piece…) in anticipation of the kit’s release. He actually added a version sized for the 22″ model (well, actually he scaled it to 1/48 scale…) at my request, very cool. You’ve made very happy an 11-year-old kid from 40 years ago. Great update cant wait for Christmas. 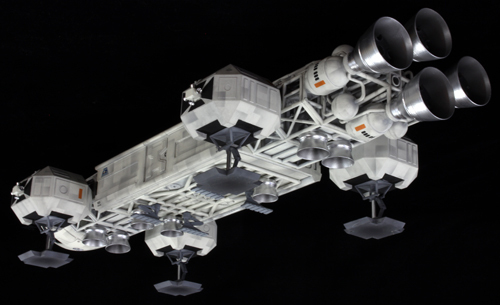 In terms of new models ever thought of doing the Babylon 5 starfury. In your capable hands it would be a thing of beauty. Where would I be able to buy one in the UK, who would be your distributers over here? Like others, I would love to get a Commlock/Stungun set. As a kid, I was given a Stungun for xmas (one of my all-time favourite toys) it unfortunately broke by Boxing day, we returned it but the store was out of stock, I never did get another one! Kits will be available in the UK as we have a distributor that sells over there, however I don’t know what specific retailers will carry the kit. In the UK you can buy the kit from Timeless Hobbies and Forbidden planet international,also Hannants have it on there website. Any word on the results from the survey? I do need to revisit those results and share some of that. Not sure when I’ll be able to do that though. Any idea when the kit will reach the UK ? Well, this is shaping up into a great looking model and I hope you sell a grundle of them. I still will probably not get one as I prefer 72nd scale and really had hoped the old kit would have been upgraded to this standard. Oh well, maybe if you sell enough of these you will go back and redo the 72nd version. Jamie I got my eagle today. The first look is amazing! Thank you everyone at R2 for getting this done!